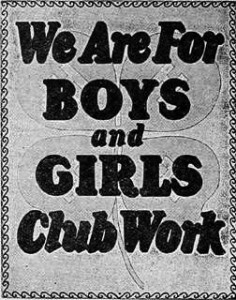 First National Poster bearing the 4-H Clover in 1924. The National Compendium of 4-H Promotion and Visibility is a history project started a year ago and placed on the National 4-H History Preservation Program website earlier this year. It is one of this year’s priority activities for those National 4-H History Team members working on the website. Rather than being a chronology of 4-H promotion history, the Compendium is a collection of short stories, so far gleaned mostly from historical issues of National 4-H News, covering a broad array of national approaches to 4-H promotion, marketing, public relations and branding. Added to this are anecdotes, some from the local level but which received national visibility, that are simply special vignettes that should not be lost to history. These stories are often the ones which convey the true meaning of what 4-H is all about: chronicles of inspiration, of achievement, leadership, and goals; accounts of failures and having the strength, ability, and desire to pick oneself up and try again. 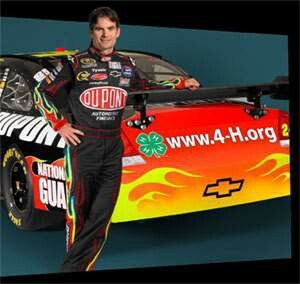 As one of the major sponsors of 4-H National Youth Science Day in 2009, DuPont provided some extra visibility extending to a massive audience; in the NASCAR circuit, the DuPont-sponsored car driven by Jeff Gordon prominently carried the 4-H emblem with the 4-H.org website on the back of the vehicle. This Promotion Compendium is meant to document and preserve these stories of 4-H history before they get lost. It has immense value as a resource tool for new professional and volunteer staff development. Even more important, perhaps, it is also offered as a collection of short stories to be read for inspiration and enjoyment. This entry was posted in History and tagged 4-H Promotion, 4-HHistory by Larry Krug. Bookmark the permalink.